MPs will not get to vote on how Brexit negotiations are handled but could still be asked to approve the "final" deal, a government source has said. Several senior politicians, including ex-Labour leader Ed Miliband, have demanded Parliament gives its verdict on the UK's departure from the EU. But Brexit Secretary David Davis told MPs there was a difference between "accountability and micro-management". The UK's exit from the EU is expected to happen by summer 2019. Theresa May is visiting Denmark and the Netherlands for Brexit-related talks as MPs debate the issue in the Commons. The Leave campaign won a majority in June's referendum, with the prime minister announcing last week that the government would trigger Article 50 of the Lisbon Treaty - beginning formal negotiations between the UK and EU - by the end of March next year. The process will take up to two years, involving complex debates about issues such as immigration and access to the European single market. Mrs May's spokesman said: "Parliament is of course going to debate and scrutinise that process as it goes on. That is absolutely necessary and the right thing to do. "But, having a second vote, or a vote to second-guess the will of the British people, is not an acceptable way forward." However, a Downing Street source offered clarification to BBC assistant political editor Norman Smith, telling him that this did not necessarily rule out a parliamentary vote once "a final" deal is reached. "This leaves open the possibility MPs could get a vote on the package eventually negotiated by Mrs May," our correspondent added. The prime minister is visiting Denmark and the Netherlands for talks on "delivering Brexit". Her discussions with counterparts Lars Lokke Rasmussen and Mark Rutte come a week ahead of her first European Council meeting. 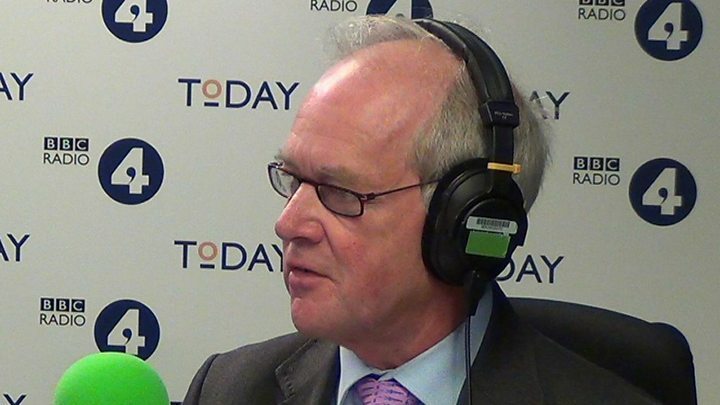 Media captionEx-Tory minister Peter Lilley says MPs who voted Remain are acting like bad losers. 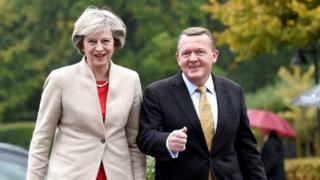 At a press conference with Mr Rasmussen in Copenhagen, Mrs May said: "We are not turning our backs on Europe. We want to maintain strong relationships with our European partners." The UK would continue to "meet our various rights and obligations" until it left the EU, she added. Mr Rasmussen said it was "tragic" that UK voters had decided in favour of Brexit, but he hoped for a "friendly divorce". There is an expectation that there will ultimately be votes on the agreement - with the prime minister's "Great Repeal Bill" and, at the end of the process, on the ultimate deal. But that is a long time away and, for many MPs, simply not good enough, when the process of negotiations will shape our relationship with the rest of the world for years to come. And with no votes any time soon, there is also - so far - nothing on paper, nothing that fits into the prime minister's chosen template of Green Papers, White Papers, and then ultimately legislation. But what if that was the plan? 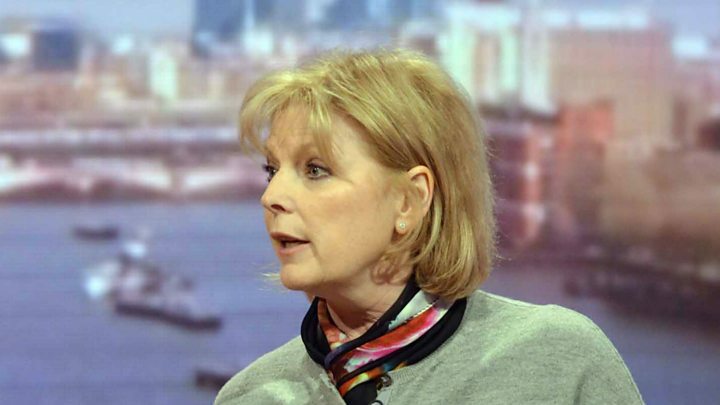 In recent days sources have told the BBC that the government was planning to produce a Green Paper this autumn with the broad outlines of its Brexit objectives. One source said "we were told there would be one in October", and that the financial sector had been asked to provide "a data dump and a shopping list" by the end of last month in order to facilitate the process. In a statement to MPs, Brexit Secretary David Davis said the Great Repeal Bill, overturning the 1972 European Communities Act, which allowed the UK to join the EU's predecessor, the European Economic Community, would be introduced in the next parliamentary session. This, he said, would prevent a "black hole in the statute book", by keeping large amounts of legislation on a national basis when the UK is no longer subject to EU law. Mr Davis reiterated the prime minister's promise not to provide a "running commentary" on the government's thinking. But former Liberal Democrat leader Nick Clegg, now his party's EU spokesman, says the Commons had a "rightful role of scrutiny" at all stages of the Brexit decision-making process. 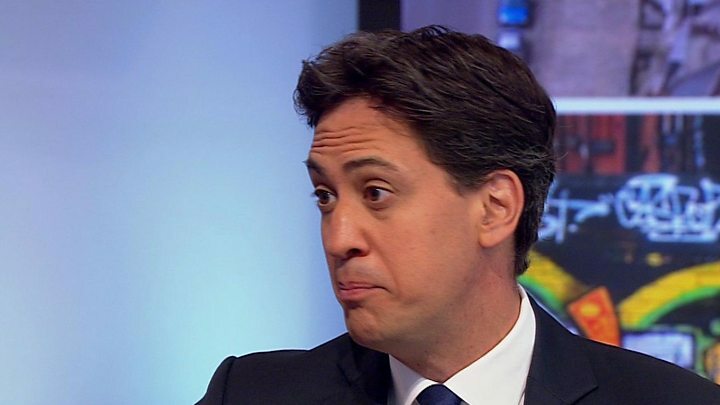 Former Labour leader Ed Miliband said MPs must have a say on the nature of the eventual Brexit deal. He told the BBC's Victoria Derbyshire programme he did not want to reverse the result of June's referendum, but that details of negotiations should not be given through "briefings and leaks". Parliament, as "the sovereign body of the people", should discuss plans, Mr Miliband said, as the referendum had not specified a "particular type of Brexit". The SNP said there was confusion over the government's objectives. Its European Affairs spokesman Stephen Gethins said: "The ongoing splits in the cabinet, which are being played out in the media in a series of off-the-record briefings, are leaving more questions than answers, causing yet more alarm and uncertainty." Conservative MP and former Attorney-General Dominic Grieve said the Commons had to be allowed to give its opinion, as this was a "very well-established constitutional convention" involving important treaties. He added: "If a situation arises that the government at the end of the day is about to conclude a deal for the future of the United Kingdom which can't command parliamentary approval - or at least acquiescence - then it's perfectly obvious in those circumstances such a government wouldn't survive. I would have thought there would have to be an election." Mrs May is due to to visit Madrid on Thursday for talks with Spanish counterpart Mariano Rajoy.